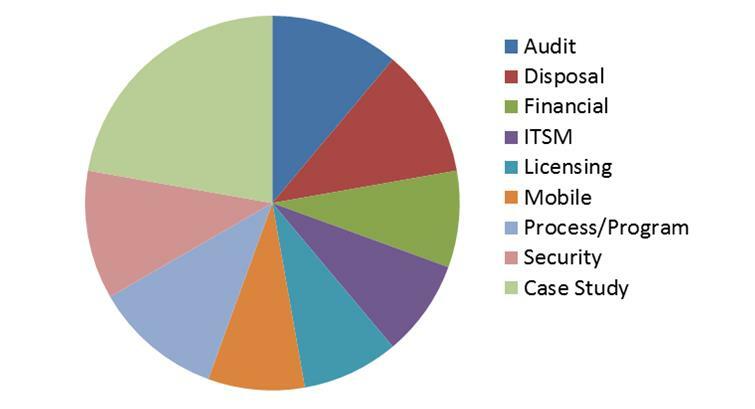 IAITAM recommends the following structure to present your business case. The materials in this document will help you acquire and build out the information. At the end of each section, an example is provided. This is a sample layout of how to communicate important details in the key areas of your business case. For a standard Business Case, complete this section after completing all other sections. Describe the current business problem and why it is a problem. How does it affect the corporate mission (i.e. we are spending more than we need to on IT costs; we are currently at risk for an audit) Include a brief statement of any company mandates or new government regulations that requires policy, education, or processes not currently in place. What is being proposed? How does it solve the problem? Describe how IAITAM and the ACE conference will help the organization achieve anticipated business outcomes and how the conference is an important component in knowledge acquisition. What new income/outcomes will result? Can costs afterwards be recouped? Reduced? You also want to provide a clear argument by summarizing key quantitative and qualitative information about IAITAM training and attendance at ACE, including a description of the impact of not implementing or refining current ITAM programs. Determine and include analysis information that is necessary to provide a clear justification to further your ITAM knowledge and how you implement new thought into your program. The type and extent of information included in the justification will vary based on the best approach for making a compelling and accurate argument. Lack of communication and understanding between IT, Finance, Education Team, Operations, End Users, etc. Try to connect these issues to the business at large. Besides having to deal with these issues within your own department or team what is the greater impact? How does the current situation affect your company? Example: IT is business today however; our current processes for managing our assets are highly reactive and short sighted. The majority of effort in my department is spent firefighting (i.e. physically counting software licenses) with little view on recurring issues, the elimination of repeat issues or systemic companywide problems. This situation is starting to negatively impact our ability to add news assets to our ITAM repository and keep current actual counts. I strongly believe that if we do not implement an approach to automate this inventory process with automatic inclusion into our ITAM repository we are not only at risk of spending needless dollars in new purchases, but also potentially open the company up to a fine and loss of productivity. Based on the issues and concerns you identified in the previous sections, this is the time to describe how you plan on solving them. Keeping in mind that you will want to address how specifically attending the IAITAM ACE Conference will help you achieve this goal. Create a universal set of standards and best practices for everyone in your company to adopt in the realm of IT Asset Management. When drafting such a standard be sure to highlight what the bottom line benefits are to your organization and individuals for following such procedures. In this section you will want to describe the IAITAM conference and how attending it will aid in solving your current IT Asset Management issues. This could be through the pre & post IAITAM certification courses, the educational content being delivered or through the networking and industry contacts you will make in your need areas. Over the last sixteen years IAITAM has been pioneering IT Asset Management as an industry and continuing to drive the profession forward in both the scope of duties as well as recognition of those performing ITAM duties as a core competency for any business. IAITAM ACE pulls together ITAM industry leaders to share knowledge and best practices in a non-threatening or sales environment. The number one focus of any IAITAM ACE event is to provide the individuals that attend the most current and highest level of education on IT Asset Management anywhere. The following categories are a summation of the needs and topics expressed by our membership and speakers who submitted abstracts for presentation. The longest running events in the world solely dedicated to IT Asset Management boast the widest array of topics related to IT Asset Management. Take a stroll around our exhibit hall and meet with industry leaders in the realm of software asset management, IT asset disposition, hardware asset management or mobile asset management. The connections and contacts you make during your time on the exhibit hall floor will only prove to be more beneficial with each passing year. Enjoy a casual and relaxed evening where you can sit back and network with peers and other industry leaders. These events are aimed to make an attendee feel comfortable and prepared to learn as well as extend the learning and content rich conversations that were started in the daily sessions. Our networking events are geared to help you gain invaluable context from your peers and further your development. For our registered attendees we offer a mobile conference website accessible from any Internet device where we can offer you a superior digital conference experience. We recognize our attendees want to be quick and agile on the show floor so we won’t bog you down with cumbersome session handouts, paper surveys or bulky schedule books. In this section we will start to build the financial case for why IAITAM training and attending the IAITAM ACE Conference is so paramount. Please note since IAITAM teaches the best practice and does not implement it in the organizations of those individuals who attend the conference we cannot provide hard figures but rather estimates and feedback from past students and members along with areas that we know industries can save money and in turn if managed improperly can cost an organization thousands if not millions in fines. The below are all concepts and management competencies that are prevalent in about IAITAM courses as well as the IAITAM ACE Conference. Become the next great success story! With IT, you can save or lose a great deal of money. The question is now “How are you managing your IT?”. The ACE Conference is an invaluable resource for anyone looking to build a new or enhance their current ITAM Program. IAITAM is keenly aware of how the current economic situation has created a challenge for those seeking approval to attend professional development events. 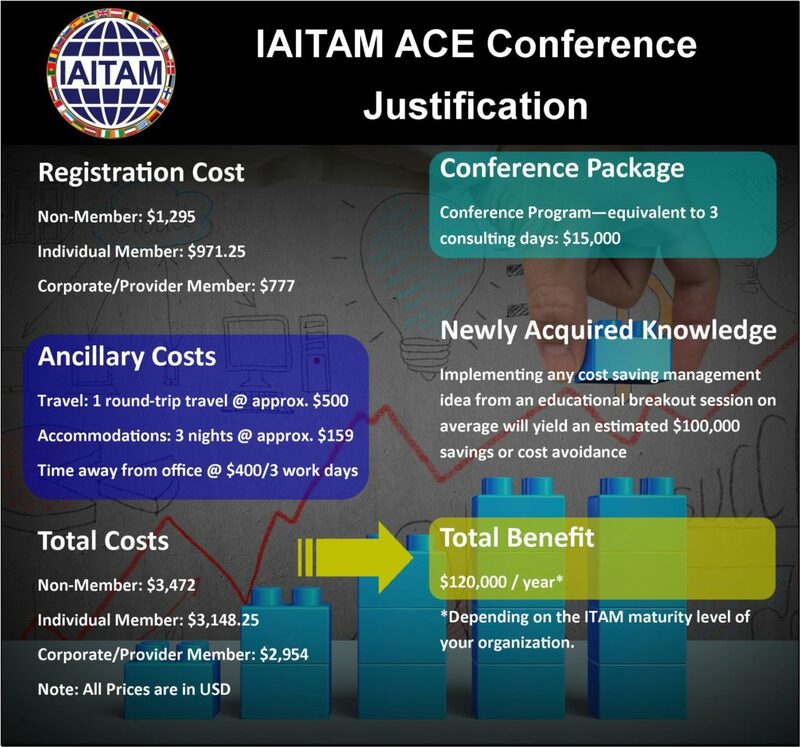 The good news is that the IAITAM ACE conference is centered on the very concept that external, objective sources are advocating during tough times – building efficient processes based on a proven framework and sound policy to drive efficiency and manage current financial expenditures while optimizing IT innovation. We are confident that if you walk away with even one idea you learned at our conference, then go back to work and implement it, this would more than pay for their conference registration fee as well as all travel related costs. The following cost/benefit analysis sample illustrates how you can calculate ROI and how long it will take for your company to recoup the expenditure. Example: As an IT asset management professional, my goal is to have an effective, efficient, and successful IT department that has well thought out and integrated policies and procedures that works for every single person in the company. In addition it is my goal to manage all IT assets from the very beginning during the acquisition process all the way through active deployment in the environment to the harvesting of data and successful disposal of the asset. This requires maintaining an ever watchful eye on where any particular asset is in our environment as well as whom it is deployed to. Any opportunity we can take to decrease unnecessary spending along with data and financial risk will only serve to benefit the organization’s bottom line. A considerable challenge we are facing is that we need to build better processes to examine recurring issues with our IT asset management systems – issues that can seriously impact our compliance (both software and hardware) and cause us to incur excessive costs. Currently, we are spending too much time “fire-fighting.” We require the knowledge and capability to better track our assets, negotiate for them and create better ROI and TCO estimates, and I recommend that we attend the IAITAM ACE conference to learn and network from the industry leaders that will be present there as well as arrive early or stay late to attend an IAITAM certification course. Many companies have already demonstrated significant ROI with IAITAM certifications and the knowledge they receive at IAITAM ACE and I’d like us to achieve the same success however I want to make sure we’re doing it correctly the first time. I need access to industry leaders, experienced practitioners and the best trainers and consultants in the industry. I have found an event that provides me with all that. It’s IAITAM’s 16th Anniversary ACE Conference going on 8-9 November, 2018 in Amsterdam, The Netherlands. Not only is this event designed to show me how to address the organization’s most important issues, but it’s also created by the organization responsible for leading the IT Asset Management industry. Going to IAITAM ACE I am quite literally going to the company that wrote the book on IT Asset Management and is the authority on the subject. Use the following email text to present your business case to your approval manager (as an attachment). You may modify it according to your particular roles within your ITAM program. I am writing to seek approval to attend IAITAM’s 16th Anniversary IT Asset Management Conference, 8-9 November, 2018 in Amsterdam, The Netherlands. As an Asset Manager for the company there are numerous aspects of this event that will allow me to significantly increase my knowledge, and as you know 2018 goals involve a more efficient and integrated asset management program. In addition to being more confident when it comes to the negotiation, acquisition, and tracking of these assets, I can ensure that these assets and investments are aligned with corporate business objectives. I have looked through the conference program and there are at least 25 sessions, including several case studies/workshops, addressing these needs. Detailed and attached for your review is a business case for my attendance at the IAITAM European ACE 2018 conference. I am happy to meet and discuss this in more detail with you at a time that’s convenient. I await your response and confirmation of my approval for this professional development opportunity.